Scientists still are mysteries of the history, which can not give a logical explanation. first stone calendar. 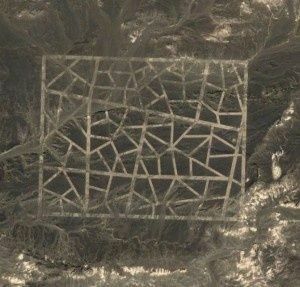 These strange lines are at coordinates 40 ° 27'28 .56 "N, 93 ° 23'34 .42" E. There is not much information available about this "strange", but a beautiful mosaic of lines exists, it is carved into the desert province of Gansu Sheng in China. Some records indicate that the "lines" were established in 2004, but nothing is officially confirmed this assumption, it seems, is not detected. It should be noted that these lines are located near the Mogao Caves, which is a World Heritage Site. The lines are drawn for a very long distance, and at the same time retain its proportions, despite the curvature of the terrain. 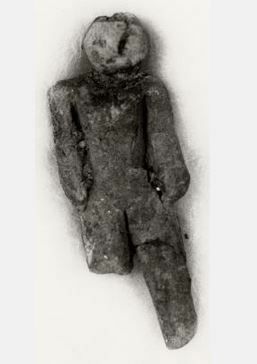 In July 1889 in Boise, Idaho, found a small figure of a man during an operation to drill a well. The find has led to intense research interest in the last century. Accurately made by human hands, "doll" was found at a depth of 320 feet, which allowed to take it back to the age, far before the arrival of man in this part of the world. The find has never been challenged, but only said that it is in principle impossible. He was found almost by accident. Expedition Center "MAI-Kosmopoisk" was seeking meteorite fragments in the south of the Kaluga Region, Russia.Dmitry Kurkov decided to look normal, it would seem, a piece of stone. What he found, can change our understanding of Earth and space history.When the stone whisked dirt on his face surface was clearly visible somehow got inside ... bolt! Length of about a centimeter. How did he get there?Bolt and nut on the end (or - on this thing was like, too - with a rod and reel two discs) sitting tight. So, got into the stone back in the days when he was a sedimentary rock, bottom mud. 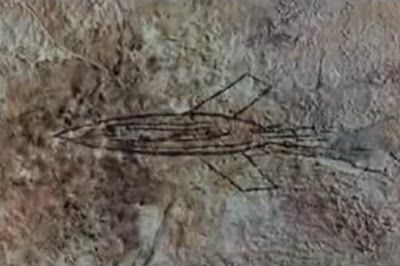 This ancient image in the cave in Japan dates back to more than 5000 BC. 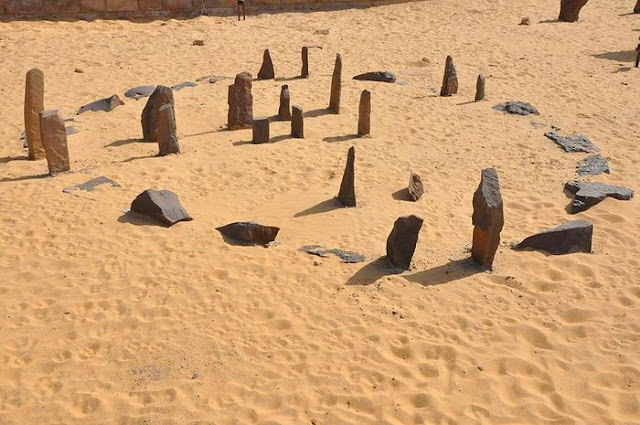 In the Sahara Desert in Egypt are the oldest known astronomically aligned, the stones in the world: Nabta (Nabta). For a thousand years before Stonehenge, people built a stone circle and other facilities on the lake, which has long dried up. More than 6,000 years ago, the stone slabs three meters high was dragged more than a kilometer to build this place. Pictured rocks - only part of the complex, which has been preserved. Although at present the Egyptian Western Desert completely dry, it was not so in the past. There is good evidence that in the past there were a few wet cycles (when up to 500 mm of rain falls in a year.) Refers to the last interglacial period and the beginning of the last glaciation, it was about 130,000 to 70,000 years ago. During this period, the area was a savanna and support the lives of many animals such as extinct buffalo and large giraffes, antelopes and gazelles different species. Starting around the 10th century BC, this area of the Nubian Desert began to receive more rain, filling the lake. Early humans may region attracted sources of drinking water. Archaeological findings may indicate that human activity in the area is known, at least somewhere in the 10 th and the 8 th millennium BC. Chinese mosaic lines. Anyone, not even NASA could not yet explain. 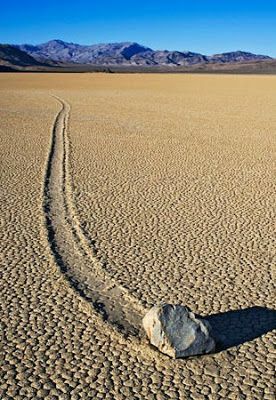 It is best to just watch and marvel moves the stones in the dry lake bed in Death Valley National Park.The bottom of the lake, Racetrack Playa is almost flat, 2.5 km from north to south and 1.25 km from east to west, and covered with cracked mud.The stones slowly move the muddy bottom of the lake, as evidenced by long trace left of them. Stones move independently without assistance, but no one has ever seen and recorded the movement of the camera. Similar movements were recorded in the rocks some other places. However, the number and length of the next dry lake Reystrek-playa unique. 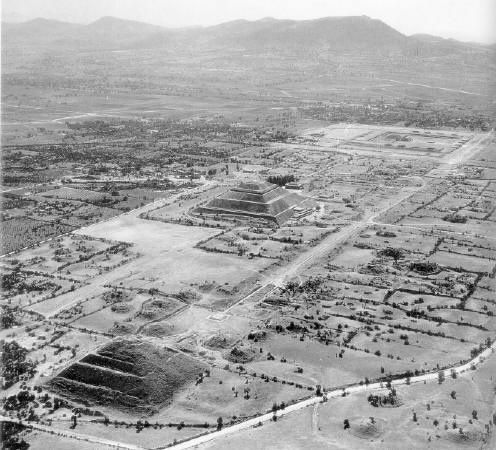 Teotihuacan, Mexico. Large sheets of mica were found embedded in the walls of the ancient Mexican city. The nearest place - mine, which produces mica, located in Brazil, thousands of miles away. Mica is currently used in energy production. In this context, the question arises of why the builders used this mineral in the buildings of the city. These ancient architects knew some long-forgotten sources of energy to use electricity in their cities? Fossilized Irish giant discovered in 1895, their growth is more than 12 feet (3.6 m). 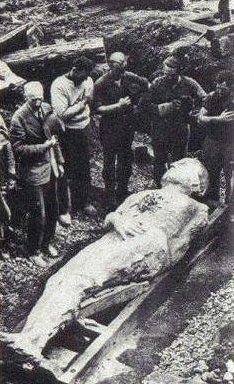 The Giants were discovered during mining operations in Antrim, Ireland. This image from the British magazine Strand, December 1895 "The height of 12 feet 2 inches, chest, 6 feet 6 inches, arm length - 4 feet 6 inches. There are six toes on the right foot. " Six fingers and toes look like some of the characters from the Bible, which describes the six-fingered giants. 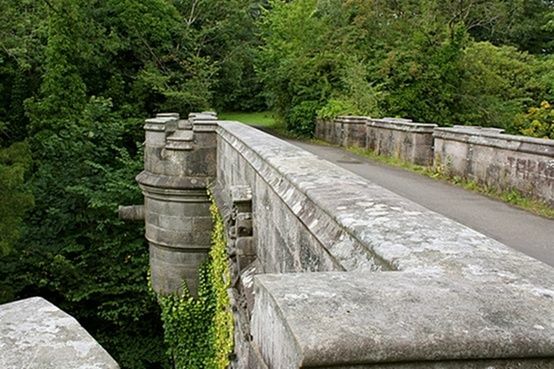 Suicide dogs on the bridge in Overtown, near Milton, Dumbarton, Scotland. Built in 1859, the bridge near Overtown famous unexplained cases where dogs, apparently committed suicide by jumping from it. The incidents were first recorded in the 1950s or 1960s, when it was noticed that dogs - usually the long-nosed species, such as collies - quickly and unexpectedly jump off the bridge and fell from a height of fifty feet, breaking the death. 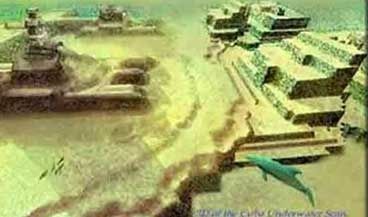 Scientists continue to explore the ruins of the so-called megaliths Yucatan Channel near Cuba. They were found at a distance of many miles along the coast. American archaeologists who discovered this place, immediately announced that they have found Atlantis (not for the first time in the history of underwater archeology). Now the place is sometimes visited by scuba divers to admire the magnificent underwater structures. All other interested parties, can only enjoy shooting and computer reconstruction of buried under the water of the city, in the age of the millennium. Nevada Indian legend about the 12-foot red giants that lived in the area when they arrived. According to the history of the American Indians, the Giants have been killed in a cave. During excavations in 1911 has been found that human jaw. 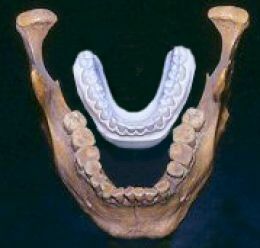 Here's how it looks next to the artificial human jaw. In 1931, two skeletons were found in the bottom of the lake. One of them was an 8-foot (2.4 m) high, the other - a little less than 10 (3 pm). This aluminum wedge was found in Romania in 1974, on the banks of the river Mures, near Ayud. They found him at a depth of 11 meters, near the bones Mastodon - a giant, like the elephant, the extinct animal. Find myself very much like the head of a huge hammer. 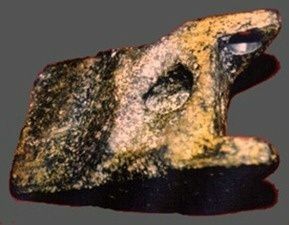 The Archaeological Institute of Cluj-Napoca, allegedly went artifact was determined that the material from which made this wedge - an aluminum alloy coated with a thick layer of oxide. 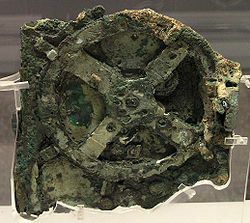 Alloy contained the 12 different elements, and finding attributed to the category of strange, because aluminum was not discovered until 1808, and the age of the artifact, given its location in the bed along with the remains of extinct animals, determined, approximately, 11 thousand years. 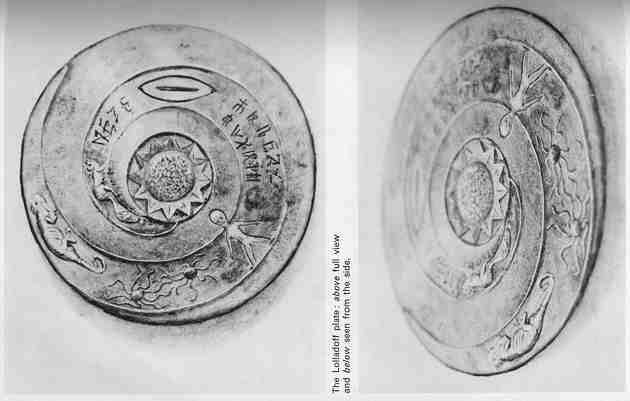 "Plate Loladoffa" - a 12,000 - year stone dish found in Nepal. It seems that Egypt is not the only place that is visited by aliens in ancient times. This clearly shows a UFO in the shape of a disk. There is also a picture on the disc. Character remarkably similar to the aliens, known as the Grey, «gray". Puzzling enigma to science is ... ordinary-looking hammer. The metal part of the hammer has a length of 15 cm and a diameter of about 3 inches. He literally sinking into the limestone age of 140 million years, and is stored together with a piece of rock. This miracle caught the eye of Mrs. Emma Hahn in June 1934 in the rocks near the American town London, in the state of Texas. Experts who examined the find, rendered a unanimous conclusion: hoax. However, further studies with a variety of academic institutions, including the famous Battelevskoy Laboratory (USA), have shown that things are much more complicated. First, the wooden handle, which planted the hammer outside already petrified, and inside and does become coal. So, too, her age millions of years. Second, experts Metallurgical Institute in Columbus (Ohio) astonished the chemical composition of the ground: 96.6% iron, 2.6% chlorine and 0.74% sulfur. No other impurities could not be detected. So pure iron did not get in the history of the earth metals. In the metal found no bubble quality iron, even by modern standards, extremely high and causes a lot of questions, as the content is not found metals used in the steel industry in the production of different grades of steel (such as manganese, cobalt, nickel, tungsten, vanadium or molybdenum). Also there are no impurities, and the percentage of chlorine unusually large. Astonishing that the iron found no traces of carbon, while the iron ore from the Earth's field always contains carbon and other impurities. Generally speaking, from the modern point of view, it is not of high quality. But here's what detail: iron "Texas Hammer" does not rust! When in 1934 a piece of rock chipped rocks with ingrown tool, metal in one place is very scratched. And over the past six-plus years on the scratch does not appear any signs of corrosion ... Estimated Dr. K.E.Bafa, director of the Museum of Antiquities minerals, which holds this hammer, the find is from the early Cretaceous period - from 140 to 65 million years ago. On the current state of scientific knowledge, mankind learned to make such tools only 10,000 years ago. Dr. Hans-Joachim Tsilmer from Germany, for the mysterious discovery in detail, concludes: "This hammer is made by an unknown technology." 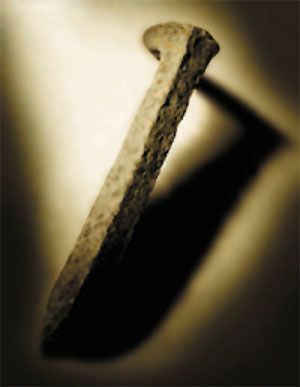 However, most often in the rock are objects, their appearance similar to nails and screws. In the XVI century, the viceroy of Peru kept in his office a piece of rock, which was strong in 18-inch steel nail found in the local mines. 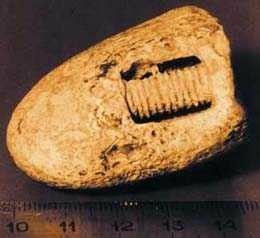 In 1869, in Nevada, in a piece of feldspar raised from great depths, found metal screw length of 5 centimeters. Skeptics believe that the emergence of these and many other items can be explained by natural causes: a special kind of crystallization of mineral solutions and melts, pyrite formation of rods in the voids between crystals. But pyrite - is iron sulfide, and at the turn yellow it (so it is often confused with the gold), and has a clear cubic structure. 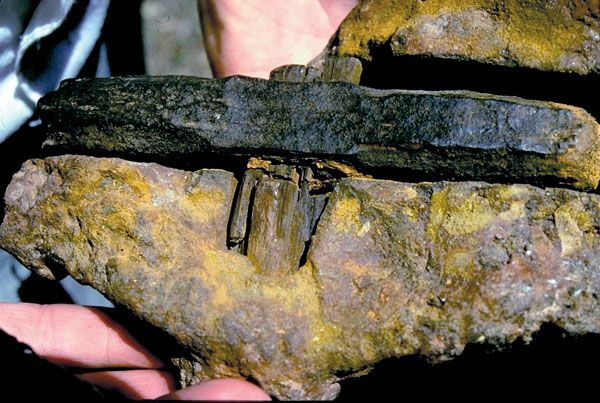 Eyewitnesses findings clearly indicate iron nails, sometimes covered with rust, and pyrite formation rather be called gold, instead of iron. Also, there is speculation that rodlike NIO - is fossilized skeletons belemnite (invertebrate marine animals that lived at the same time of the dinosaurs). But the remains of belemnites are found only in sedimentary rocks, and never in the root, such as feldspar. They also have a strong skeletal form, and confusing them with something else impossible. It is sometimes argued that gvozdeobraznye NIO are the melt fragments of meteorites or fulgurity (thunderbolts), obtained by a lightning strike in the rocks. But finding a splinter or trail left millions of years ago, is extremely problematic. If the origin of gvozdeobraznyh NIO still possible to argue, that on some findings can only shrug. The second group of findings that put the puzzle to scientists, are artifacts created after the today's time of the appearance of man on earth. But the technologies that were used in their creation, we have become known recently or are unknown so far. The most famous find of this group are crystal skull found in 1927 during excavations in Belize City Maya Lubaantuma. Skull carved from a piece of pure quartz and measures 12h18h12 centimeters.In 1970, the skull was analyzed in the laboratory by "Hewlett-Packard". The results were stunning. 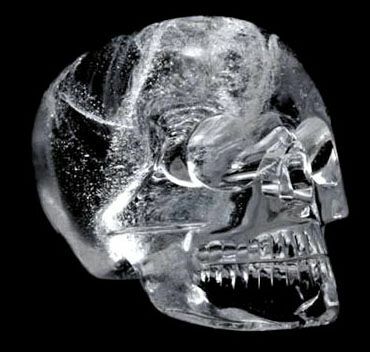 The skull was created without following the natural axis of the crystal, which is impossible in modern crystallography. When working on the skull does not use metal tools. According to the restorers, first quartz Hacked diamond chisel, and then for a more thorough treatment of the crystalline silicon used sand. To work on the skull spent about three hundred years, which may be perceived as an incredible example of patience and recognize the use of unknown high technology. One of the experts, "Hewlett-Packard" said the establishment of the Crystal Skull is not a question of skill, patience and time, but it's just not possible. In 1936, German scientist Wilhelm Koenig, who worked at the Archaeological Museum of Baghdad, brought a strange object that was found during the excavations of the ancient Parthian settlements near the Iraqi capital. It was a small clay bowl height of about 15 centimeters. Inside it was a cylinder of sheet copper, its base covered with a seal cap, top hat covered the resin, which also held the iron rod aimed at the center of the cylinder. 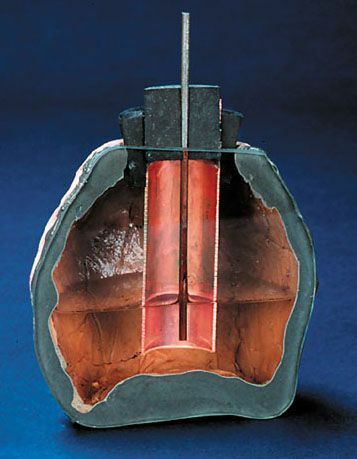 From all this, Dr. Koenig concluded that before it was an electric battery, created almost two thousand years before the discoveries of Galvani and Volta.Egyptologist Arne Eggebreht manufactured replica of the finds in a vase filled wine vinegar and connected the measuring device shows the voltage of 0.5 V. Presumably ancients used electricity for use on items thin layer of gold. The largest of all the stones carved by man is a stone Lebanon. It weighs 2000 tons. 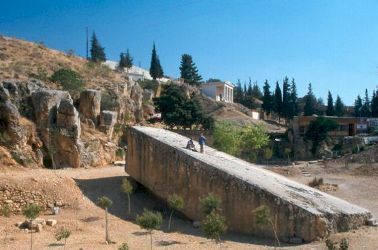 It was intended to Baalbek, which is a 2 hour drive from Beirut.Baalbek terrace built of stone blocks, which are about 20 meters long, 4.5 meters high and 4 meters long. These stone blocks reach up to 2000 tons.Terrace is much older than the temple of Jupiter, located on it. Wondering how to carve, and then transported and built of the stones the ancient people? And to date there are no technical means for movement of the goods. 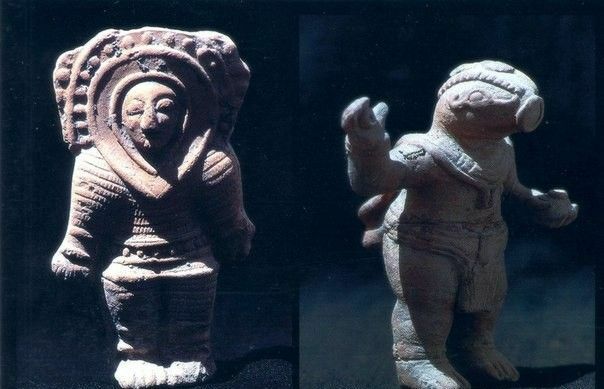 Figures ancient astronauts found in Ecuador. Age> 2000 years. In fact, so full of such evidence, if you like, read Erich Von Denikin. He has many books, one of the most famous - "Chariots of the Gods", there are both physical evidence and deciphering cuneiform and other stuff in general is quite interesting. True believer vehemently read contraindicated.